"We need to find the courage to really be there for one another. Because no one can go the distance alone." Unni Turrettini is a writer, speaker, and involved citizen. Whether exploring the twisted mind of a lone wolf killer or the hubris of the Nobel Peace Prize committee, she shines a light on hidden secrets and motivations. Unni’s work is about truth-telling and about speaking for those who have no voice. Underneath anger there is always great pain. She feels that knowledge of human frailties and the conditioned mind can shed light on everyone’s motivations, and bring us closer to a true understanding of what drives all actions. And she believes that each one of us has the power to make a difference. The first step is awareness. July 22, 2011 was the darkest day in Norway’s history since Nazi Germany’s invasion. It was 189 minutes of terror—from the moment the bomb exploded outside a government building until Breivik was apprehended by the police on the island of Utøya. Breivik murdered seventy-seven people, most of them teenagers, and wounded hundreds more. The massacre left the world in shock. What makes person a bully and someone else a target? Bullying in different cultures; solutions that work. We are all conditioned to believe certain lies about ourselves and others. Most of these beliefs are based on fear. Learn to see through your conditioning and find yourself. What are the warning signs when there’s no paper trail? What can be done to stop them? How do they differ from other mass murderers? What can be learned by studying the manifesto of a killer. If you are interested in booking Unni for a speaking engagement, please use the contact form at the top of this page to reach her. GREAT DAY / KMPH FOX 26, Fresno, November 5, 2015. Discussing “The Mystery of the Lone Wolf Killer”. Born and raised in Norway, Unni’s curiosity led her to live nearly half of her life abroad. She graduated from high school as an exchange student in Kansas City, Kansas, and she has law degrees from Norway, France, and the United States. Before becoming a full-time writer, she worked as a lawyer and in finance in Paris and Geneva, and is a member of the New York Bar. Her multicultural upbringing has provided her with a flexible worldview and a deep understanding and compassion for differences in both people and cultures. Because of her international background, she speaks and conducts research in several languages. Unni travels frequently to the United States and elsewhere to speak at conferences, colleges, universities, and associations. 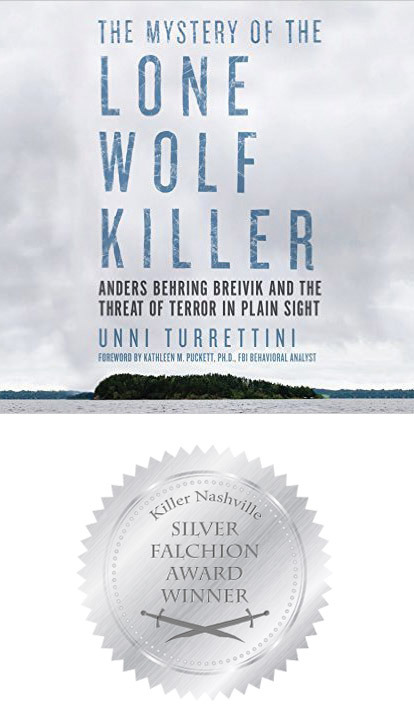 Unni Turrettini does a magnificent job of illustrating the evolution of Anders Breivik in the context of modern Norway, a world she knows is fertile ground for the development of a lone wolf terrorist. She recognizes what authorities have preferred to ignore: that privilege and comfort in a society do not eliminate the likelihood of a terrorist blooming in its midst. She [shows] what can be done to prevent the savagery lone wolves inflict in any country. Actions like those of lone wolf Breivik are seemingly incomprehensible and easily dismissed as those of a single crazed individual. Turrettini combines a discussion of Norwegian culture and social psychology to create a compelling analysis that is simultaneously deeper and more frightening. In today’s world, the man on a shooting spree is everyday news. Turrettini points to a solution that will surprise—and then make perfect sense. The author's argument has wide application: namely, that by overlooking announcements of intent, in effect, that these killers often make before acting, law enforcement officials will miss the lone wolf killers among us. An urgent but evenhanded treatise that deserves a wide readership. Anders Behring Breivik, whose July 22, 2011 killing spree in Norway ended 77 lives, is characterized here as a “lone wolf killer,” and compared and contrasted with past mass murderers, primarily Theodore Kaczynski and Timothy McVeigh. The thesis, that lone wolves can be identified only by sensitive observation by the communities within which they attempt to form connections, is believable and clearly stated. Deeyah Khan is a Norwegian human rights activist, especially in regards to women’s voices and freedom of expression. She uses music, words, and film to convey her powerful messages. OPS – Oceanic Preservation Society is a group of activists, artists, and change agents led by Academy Award-winning film maker Louie Psihoyos committed to sustainability and preservations of our oceans and the planet. Nick Danziger has spent the last 25 years photographing the world’s most dispossessed and disadvantaged, using his talent to bring awareness and make change. Julie Ringnes created her first skin oil as an act of love when she couldn’t find a product to safely soothe and heal her child’s eczema, she created her own line of products. Her oils are all natural, and equally good for the planet. Julie is a truly inspiring person and friend!